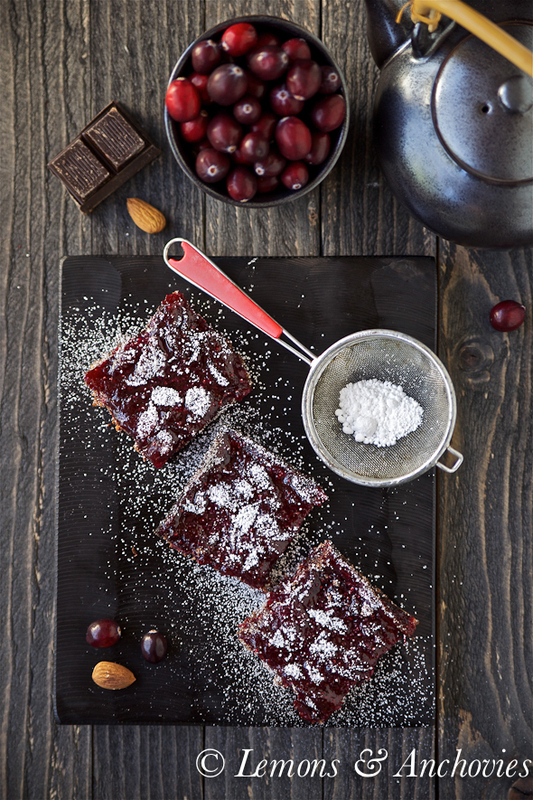 The idea for these cranberry bars with a chocolate crust has been brewing for weeks. I’m part of a fun group of bloggers brought together by our love of chocolate. Each month we are challenged to pair chocolate with a special ingredient and this month, of course, it’s cranberries. When the November theme was revealed, cranberry bars almost immediately came to mind–the inspiration coming from one of my favorite sweets, lemon bars. Most of the recipes I found online are baked with a thin layer of cranberries and topped with streusel (nothing wrong with that) but I didn’t see any with chocolate. Would cranberries taking center stage be a hit or miss? I had doubts, to be sure, but I had to try. My goal was to showcase the tartness of the cranberries without overwhelming the taste buds. So I cooked them with just enough sugar to bring out their best without feeling like I was eating cranberry jam and I also opted out of adding any spices so the topping wouldn’t be mistaken for leftover cranberry sauce. My biggest doubt was whether or not the chocolate crust would work. As it turns out, the chocolate and cranberries got along well together. I made a shortbread crust with unsweetened cocoa powder (not the chocolate bar that is pictured here; lazy photographer! ), chopped almonds and oats. The latter two ingredients gave the crust a very nice, crumbly texture and the deep chocolate flavor was bold enough to hold its own against the tart cranberry topping. The chocolate actually anchors the bars. Without it the cranberries would be too much on their own. But he did ask me (a few times) to publish this recipe with a caveat. He asked that you not be so quick to dismiss this cranberry dessert if you belong in his camp. He ate over half the batch in less than 24 hours so he thinks you might enjoy them, too. Success. Check out the link below for other Chocolate-Cranberry goodies the rest of the group has baked this month for the Chocolate Party. 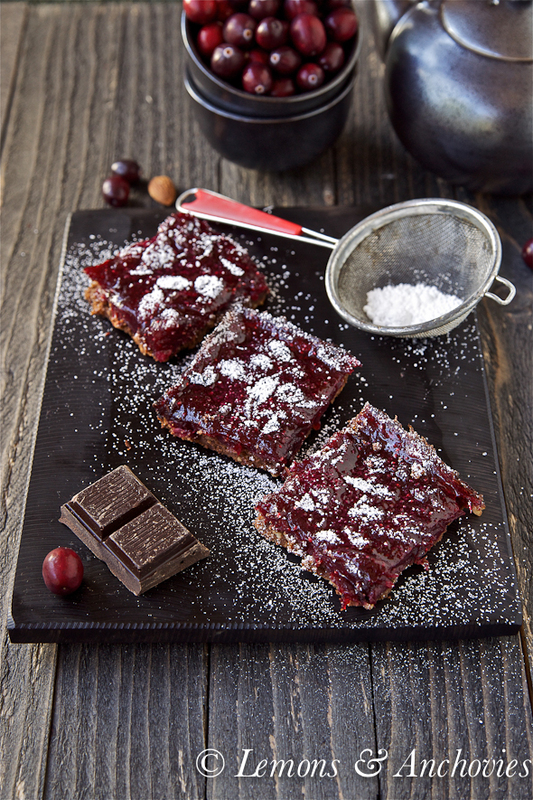 A dessert bar showcasing the tartness of cranberries on a crumbly, chocolatey shortbread crust. To prepare the crust: Preheat your oven to 350°F. Butter an 8-inch square pan, line it with wax paper and butter the top of the wax paper. Set aside. In a bowl of a stand mixer, sift together the powdered sugar, flour, cocoa powder, salt. Add butter, oats and chopped almonds and, using the paddle attachment of the mixer, mix the ingredients on low speed just until a soft dough forms; this will take less than a minute. Transfer the dough to the prepared pan and spread out to the corners. If your dough is too soft, refrigerate it for a few minutes to make it more manageable. I rubbed my fingertips with a little butter to keep from sticking. It's also much easier to push and press the dough out from the center to the corners. Cover the dough with wax paper or foil and add pie weights. Bake for 10 minutes then remove the weights and cover and bake for another five minutes. To prepare the filling: Combine the sugar and water in a medium saucepan. Bring to a boil then add the cranberries. Cook on med to medium-high heat until the cranberries pop, about 5-6 minutes. Add the butter and juice and cook for another 3-4 minutes on medium low heat until the mixture thickens. The crust should be ready by the time the cranberries finish cooking. Pour the cranberries into the pre-baked crust and distribute evenly onto the pan. Place the baking pan back in the oven, raise the oven temperature to 400°F and bake for another 15 minutes. I pulled the pan out of the oven when I started to smell the chocolate in the crust. Cool in the pan on a wire rack before cutting into squares (I cut in 9 squares). Sprinkle with powdered sugar before serving. Beautiful bars, Jean! A perfect addition to the Chocolate Party! Mmm, I recognize that chocolate as trader joe’s pound plus… perfect for baking with! This bar recipe sounds like a perfect holiday concoction! I’ve never thought chocolate and tart cranberries would be friends in my mouth but these bars of yours seem to tell me that I’m nuts. Yum. Hehee your husband story made me smile. I’d probably eat the entire batch so happily because I love chocolate and cranberries! What a great combination and looks so delicious…. I like that you left the top without crumble. They are truly gorgeous and can imagine how good they taste! A wonderful bar. These look absolutely delicious and perfect for Christmas. I love cranberries at this time of year. great flavor combination! I like berry tartness combined with chocolate. I make a chocolate-cherry crostata that has similar flavors. I saw these last night on Pinterest before going to bed and I had pleasant dreams thereafter about cookies, cranberries, shortbread… no joke. I need a bite of these asap! What a delicious way to pair cranberries with chocolate! Absolutely amazing! Love love love the gorgeous color! I am planning a deep red Thanksgiving table and these bars would be perfect! 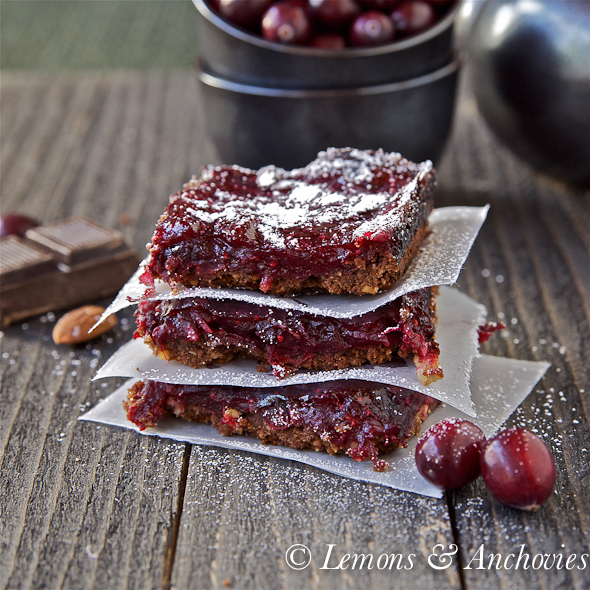 If these are a cranberry-chocolate version of lemon bars, I’m already in love! 😀 They’re gorgeous–garnet red gems sitting atop a rich brown cushion. I think I’d eat over half the batch in under 24 hours too! If this is being a lazy photographer, I can’t imagine what glory you would turn out when you weren’t feeling lazy. You have made these bars glow. The color of the cranberry layer on your bar cookies is striking and would be fun to see for dessert on the table at Christmas;-) I’m glad you brought such a wonderful treat to the chocolate party! perfect combo of cranberries and chocolate! kudos and so glad to have found your lovely blog to follow along! Oh these bars look fantastic! So pretty! A delightful flavor combination. Those bars look and sound amazing! Wonderful presentation and clicks. This is so beautiful! I love the combination of chocolate and cranberries!!! great addition to the chocolate party! Wow, these are lovely Jean, I bet the taste fantastic. Funny about your hubs. If these beautiful bars were almost finished by a cranberry hater like him then this would be gone in my mouth half the time because I love both flavors and together? Seems like you did a splendid job in merging them! You have a wonderful aesthetic sensibility, Jean. These are a classy treat and showcased similarly. Here’s to the chef! Where shall i start? With the STUNNING photos? or with the amazing description of these bars that would make everyone droll in a heartbeat? With I was your taste-tester, I probably had eaten the whole pan just to be on the safe side. Aw, thanks, Roxana. Glad you like these cranberry bars. I stopped making cranberry sauce at Thanksgiving because I’m the only one who really enjoys it. Oh, well! They look unbelievably delicious and will most definitely feature on my Inspiration week 13 and link back to your recipe. I haven’t been here for a while, I now remember what attracted me to your site, such fabulous recipes that make your mouth water. OMG. Someone needs to send me fresh cranberries right now so I can make these. They look decadent. Hi, Olga. I think it should work without the nuts. Maybe you can add an additional 1/8 cup of the oats just so the texture of the crust doesn’t change too much? This is just an idea. I think if you omit the nuts and don’t add additional oats you should be okay. Please let me know how it goes if you do try it. These sound divine! I just tried your Thai-Style Baked Turkey Patties which were amazing and have been finding all sorts of other great looking things to try on your blog! Thanks for the great recipes! Looking forward to trying these!